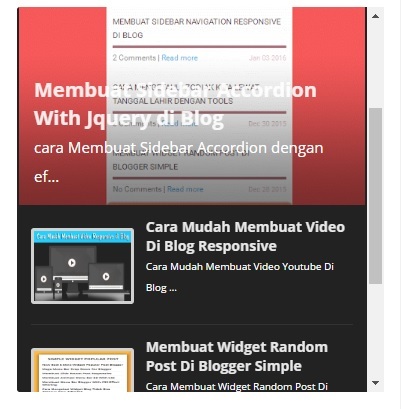 Hello guy, It has been a while but today I'm back with a cool blog widget which is responsive Automated Random Post Slider. This blogspot slideshow widget will let you showcase your posts randomly on the homepage just as seen on popular premium blogger templates. This is a slider gadget for blogger blog that displays your random posts randomly in a smooth scrolling manner. It is very responsive and will shrink to fit any screen size its viewed on be it Mobile devices or Desktop devices. Of course, using a responsive random post slider for blogger do have some advantages. Random posts widget for blogger will beautify your blogger blog Design and make it look more professional. Most of all it increases your blog click-through rates and page views by showcasing post randomly on the homepage for users to click. Not like another free slideshow widget for blogger out there, this responsive random post slider is 100% responsive and very fast in loading, it won't affect your blogs loading speed. In this tutorial, I have made the installation of the automated random post slider on blogger as simple as I can for the sake of beginners with little to no experience in coding. Follow the below steps carefully to learn how to install this blogger slider html codes. 1. Goto your blogger dashboard, select Template and click on Edit HTML.